A council is to offer free sanitary products in all its public buildings in a bid to tackle "period poverty". North Ayrshire Council said it was the first UK local authority to extend free provision to all libraries, community centres and other public offices. Sanitary products will be offered via vending machines in toilets in up to 100 buildings. The council was already one of the first to introduce free sanitary products in secondary schools. Since launching that initiative last August, young woman have benefitted from over 13,000 free sanitary towels and tampons while at school. Council leader Joe Cullinane said: "Sanitary products are a necessity, not a choice. "I wish for no women or girl here in North Ayrshire to find themselves in the embarrassing and often degrading situation of having to use improper sanitary protection simply because they cannot afford it. "After all, periods are not exempt from poverty - they don't take account of what is in your pocket or purse. Therefore, it is absolutely right that we should look at ways in which to tackle this gendered inequality." Shauna Gauntlett, from Dundee, had experience of period poverty when her son was born. She told the BBC's Good Morning Scotland radio programme: "After I had my son I had to rely on friends and family to get me things like sanitary towels. "We didn't have enough money at that point. We had a few extra bills and I had spent the money I had. "I had come home from the hospital and my stitches had burst. "It wasn't a lot of money (for sanitary products) but it was another added expense on to the fact that we didn't really have any groceries or anything at that time." She added: "I also remember having problems at school accessing these items because we weren't particularly well-off, and it wasn't a very nice experience." Poverty campaigner Ewan Gurr said the expense often became a greater issue for women after childbirth. He said: "We have met mothers who are sometimes paying up to £14 and £15 for maternity pads. "It is an added expense. This is an essential item. It is not an added extra and we really need to get it into the hands of the people who need it." 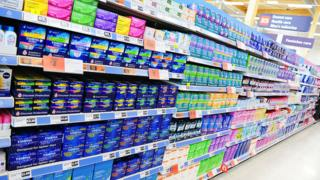 He described the move by North Ayrshire Council to offer free sanitary products in all its public buildings as "a massive step forward" and he said it was "something we need to see right across the 32 local authorities of Scotland". A recent survey of more than 2,000 people by Young Scot found that about one in four respondents at school, college or university in Scotland had struggled to access sanitary products. From this start of this term, the Scottish government is now funding provision of sanitary items at schools and universities. Following a pilot scheme in Aberdeen, it is also funding free availability in some areas to women on low incomes. Labour MSP Monica Lennon, who is currently piloting a member's bill at Holyrood to create a statutory duty for free provision of sanitary products, praised the council for "leading the way" on the issue. She said: "I hope other organisations will follow their lead. No-one should face the indignity of being unable to access these essential products to manage their period." A consultation on Ms Lennon's bill has attracted the support of 96% of respondents for the proposals to become law.